When I woke up this morning I could hear rain out the window, there was a general chill in the air and I knew tonight Wild Man and I were going to my families house to paint pumpkins (best halloween tradition, ever, btw) and I was instantly filled with this desire to just fully immerse myself in all things FALL. I started with my make up. Using earthy tones I created a warm look that I think can qualify as a simple, attainable Fall look. I used a mauve blush, a burnt orange eye shadow all over my entire lid and a lip color slightly darker than my natural lip color. For my outfit I wanted to pull in some Fall colors but also stay comfortable. 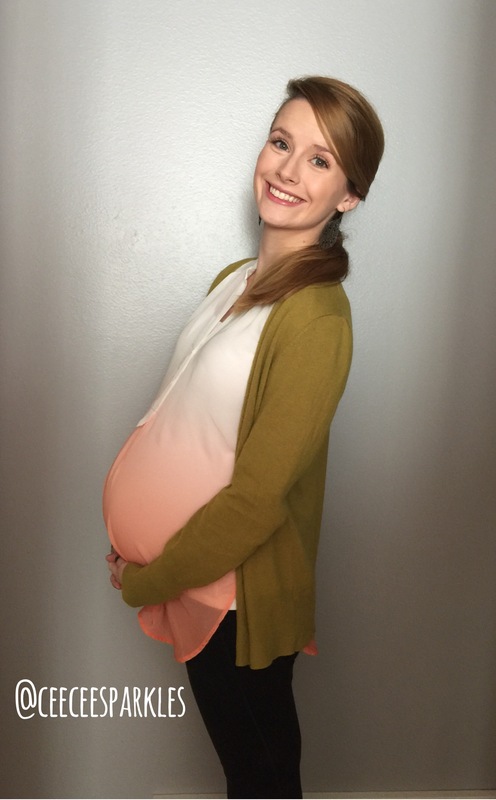 “Comfort is the main priority” is kind of my maternity fashion motto as of late. My belly feels SO heavy and all my joints hurt so sometimes getting all dolled up just seems like too much effort and too much ouch. Ultimately, I’d love to just stay in my pajamas or robe all day, but since thats not always an option (dangit), I just have to be sure that my outfit is still comfortable, not restricting and if its cute – or even just kind of cute – then bonus. Leggings are a no brainer. I wear these black leggings from Gap (find similar: here) multiple times a week because of how comfy, stretchy and versatile they are. To those of you who believe leggings are not pants – good for you, I respect your opinion, but I personally believe they are totally pants. I paired my leggings with an old blouse from Target (i searched for something similar, but with no luck) that is white and ombre’s into a peach then into a darker orange. Orange = Halloween color, so I was all about that. Plus its flowy and fit over Baby Boy. Score. Because this blouse is pretty sheer and it was semi-chilly outside, I threw on a olive green (ish) cardigan also from Target (find similar: here). I think its important to state that I had grand intentions of doing something really cute with my hair. But then I started to get hungry so I opted for a quicker option. Whenever I do my hair like this, for whatever reason I remind myself of a teacher. Maybe I had a teacher who did their hair like this? I don’t know.. But I like it, its easy to style and it takes just a couple minutes. Clearly, I didn’t spend a lot of quality time making sure it all looked 100%, but oh well. I did my hair, when I just as easily could have thrown it up in a top knot on top of my head. So we’re good. 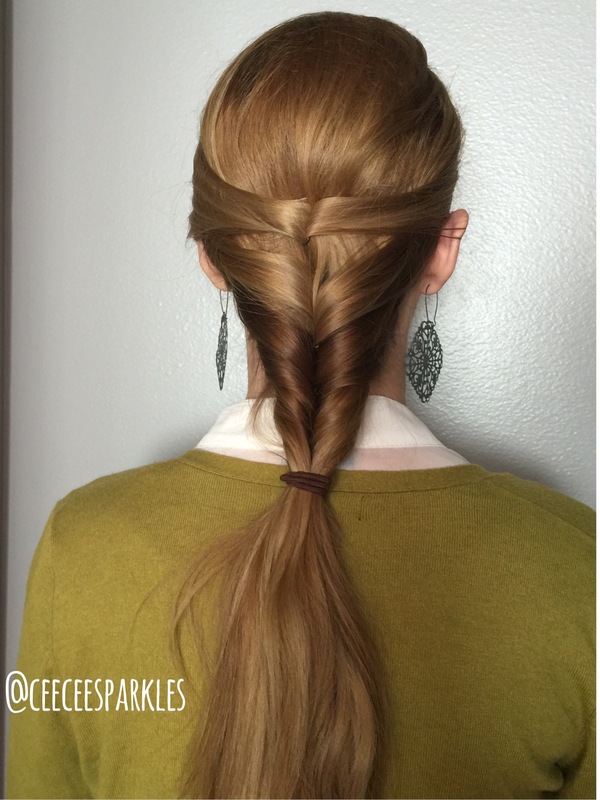 If you’re at all interested in a tutorial on how I did this hairdo, let me know and I’ll put one together. Now I have to talk about these shoes. So. For those of you kind, sweet people who tell me I am only pregnant in my belly (bless you, i love you, may all the good luck in the world come to you for making me feel so confident in this funny shaped body), what you may not know is that I am also very pregnant in my lower legs, ankles and feet. We are talking swollen-city. I have tree stump calves 90% of the time and my feet are so fat its actually caused me a great deal of pain. Side Note: Can feet explode? I think mine might, soon… Anyway, unfortunately all my regular shoes I’ve been wearing, including several pairs of flats that I adore with all my heart, don’t really fit anymore. I can squish my foot in there but its instant misery. No thanks. A couple days ago my cute momma-dear took me to Target (in case you haven’t caught on, Target is my favorite store and I will never change that) and we looked for ‘fat-feet-shoes’. 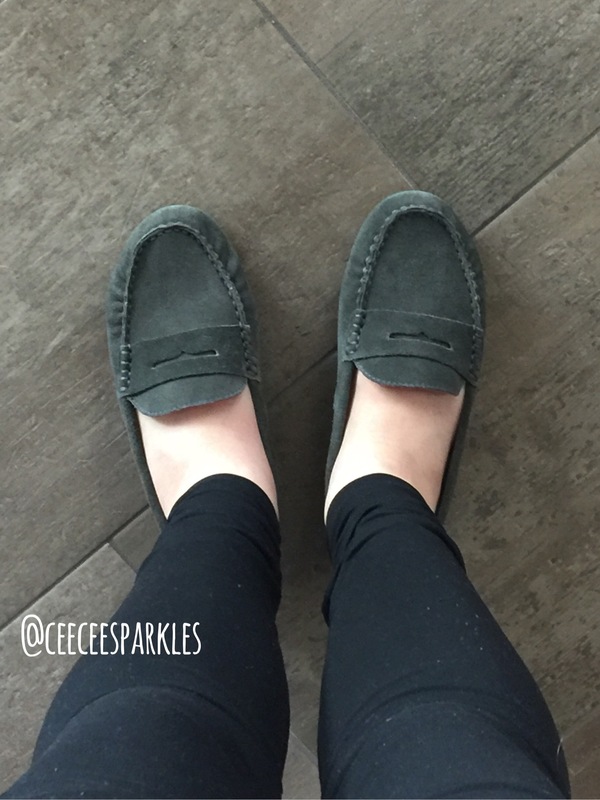 We found these loafers (find them: here) and my worlds never been the same. 1) They look like shoes my grandpa wears and while that may sound like a negative point to you, its totally a selling point for me. 2) They have squishy soles and pad my feet. 3) They are loose enough that even my feet at their most swollen state can fit into them – and not squish into them, but still slide right in! These help me feel less tree-trunky and more human-leggy. Its wonderful. Also, the fact that I’m sharing a picture of my swollen legs, ankles and feet with you should make you feel very special that I trust you enough to look at them without too much judgement.